Disconnect from hectic every-day life, then reconnect with your loved ones on this incredible family wilderness adventure. Stay in beautiful safari tents amidst towering fir trees. Hear the ocean lapping at your doorstep and the occasional blow of passing whales. You’ll explore sea creatures great and small by day, then spend the evening around the campfire telling stories and sharing laughter. Marvel the remoteness and beauty of Blackfish Sound, as you deepen your connection to nature. Experience the joy of device-free days, as iPhones take a backseat to orcas and ocean! Imagine – spending time as a family to a backdrop of towering fir trees, with the blues and greens of the ocean lapping at your doorstep. Share stories every evening around a crackling campfire, with the Milky Way shining overhead. This area is known for its biodiversity – an array of animals spend their days here feeding, socializing, and playing. 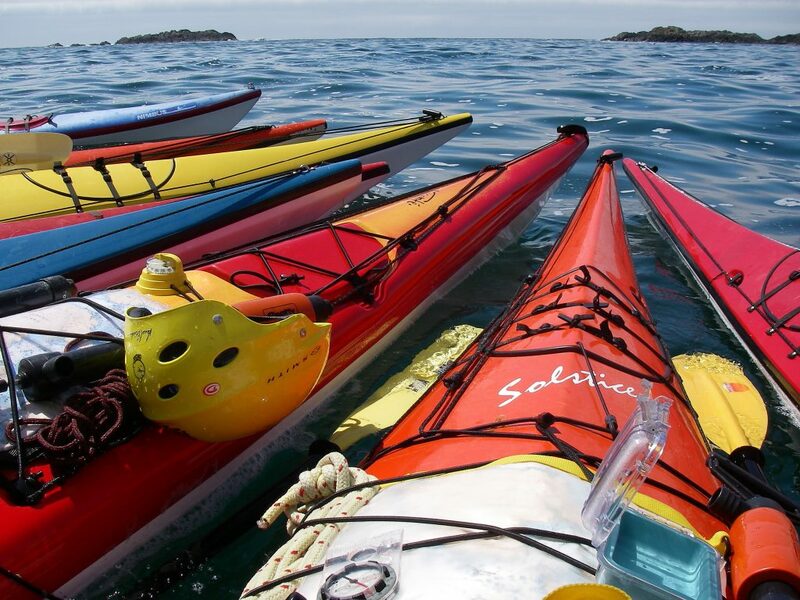 As you paddle, listen to the beautiful songs nearby orca whales with an underwater hydrophone. Share the thill of spotting a bear foraging under rocks and watch as eagles as they catch salmon. You can relax - you’ll always be under the watchful eye of your experienced wilderness guides. Welcome to Vancouver – the home of Fresh Tracks Canada! One of the most beautiful cities in the world, Vancouver is surrounded by towering mountains and sparkling ocean. Soar over islands, sea and mountains on route to Campbell River. On arrival you will be picked up at the airport and transferred to Painter's Lodge in beautiful Campbell River. Today you will take a short but scenic water taxi from Painter's Lodge to April Point Resort. Overnight at April Point Resort & Spa. This is where breathtaking scenery, vibrant marine life and the laid-back pace of the islands come together. Set on the coast of Quadra Island, the resort is just a short water shuttle ride from Campbell River on Vancouver Island. Indulge in a treatment at the oceanfront spa or kick back on the deck and keep an eye out for wildlife. Journey up Discovery Passage and safely through the Seymour narrows. Look out for sightings of porpoises, dolphins, sea lions, and whales! After a boat transfer, arrive at your remote wilderness base camp on Blackfish Sound. First afternoon paddle to get acquainted with the area. This evening, indulge in a fresh salmon dinner and enjoy the sunset from the hot tub before heading to bed for your first night in the wilderness. After a hearty camp breakfast, your kayaking adventure continues. Paddle to one of the many pocket beaches for a picnic lunch with plenty of opportunities for stretching and snacks as well as time to explore the intricate shoreline. For the very brave, there is always the option for a dip into the chilly waters of Blackfish Sound before a restorative soak in the hot tub! Today, a covered vessel takes you further into Blackfish Sound, giving you the opportunity to cover areas beyond the reach of your kayak. This morning, enjoy a 3-hour boat exploration further into Blackfish Sound, Johnstone Strait or Queen Charlotte Strait for great wildlife viewing opportunities. Return in time for lunch at base camp and enjoy a leisurely afternoon kayak. Soak it all in on your final day of exploration in Blackfish Sound. After a morning paddle, enjoy a scenic water taxi ride back to Quadra Island for the evening. Quadra Island is yours to explore today, with an extensive activity menu you can choose from. Watch grizzly bears, rent a bike, go golfing, or embark on an exhilarating zodiac tour! The largest and most populated of the Discovery Islands, Quadra Island is nestled between Vancouver Island and the mainland of British Columbia. Quadra is a popular destination for visitors from around the world, and is best known for its natural and beautiful wilderness scenery, and its excellent salmon and freshwater sportfishing. The mild temperate climate, rural lifestyle, pristine environment and the friendly people who call this place home all add to the charm of Quadra Island. You will be flying over the islands, sea and mountains once more as you return to the vibrant coastal city of Vancouver. Take a short water taxi transfer from April Point Resort to Painter's Lodge. Let a shuttle transfer take you from Painter's Lodge to Campbell River Airport. With fond memories made, your Canadian adventure comes to an end. Quadra Island water taxi operates from late May to late September. Our trip was great! Our favourite part was the beautiful country and fun activities. Fresh Tracks did a great job. Very helpful and responsive. We had a fabulous time. Everything was great. My one granddaughter said it was the best trip ever! Everyone was very responsive to our concerns as we planned the trip, and we did not need to call about anything while on trip. Our favorite parts were the Stampede show and the drive to Jasper. We had an amazing vacation! We saw so many awesome things and experienced so many exciting adventures! The scenery was even more beautiful than we expected and the weather was perfect. Thank you for helping us plan such a great vacation! Everything you gave us was so organized and so easy to follow, that everything went very smoothly. All of the hotels were great! We were given free upgrades at Lake Louise and at the airport hotel in Calgary, which was a nice surprise. The hotel in Banff was very nice, although it did not have air conditioning. The hotel in Jasper was a great hotel! All of the activities you helped us plan were phenomenal! We really enjoyed the Olympic Park, rock climbing was fun and scary, and the gondola in Banff was very cool! The river rafting was the highlight of our trip! The longer day was so much fun, with great scenery and very fun rapids! They even let us rent a GoPro for the rafting, so we got some amazing video of the rapids! Canoeing Lake Louise was spectacular! The color of the water was unreal! The rental car was great too, it was a nice size and good for the nearly 1,000 miles we drove. This vacation had a great mixture of planned activities and plenty of time for unplanned activities. We saw two waterfalls on the way back from river rafting that were simply beautiful, and because we had some open time, we were able to visit them. All in all, it was one of the best vacations I have ever been on, and I have been on many vacations. I would highly recommend you and your company to anyone who is thinking of vacationing in Canada! I have already passed your name along to my parents, who are very jealous of our vacation. Thank you so much for organizing what was a truly wonderful vacation and celebration for our 25th wedding anniversary. Our Rockies itinerary was a truly memorable experience and we appreciated the extra touches, such as the chauffeured transfers and the hotel rooms with exceptional views that you had included for us. Our favourite spot was Moraine Lake and the beautiful lakeside room made it even more special for us. Thank you once again and we hope to contact you when we start to prepare our vacation for 2016!